Construction often happens on sites where access is severely restricted due to its location in a confined space where sites can be particularly small or limited, and with operatives often working at considerable height. Here, Brian Butler looks at how contractors are working around spatial restrictions such as these. 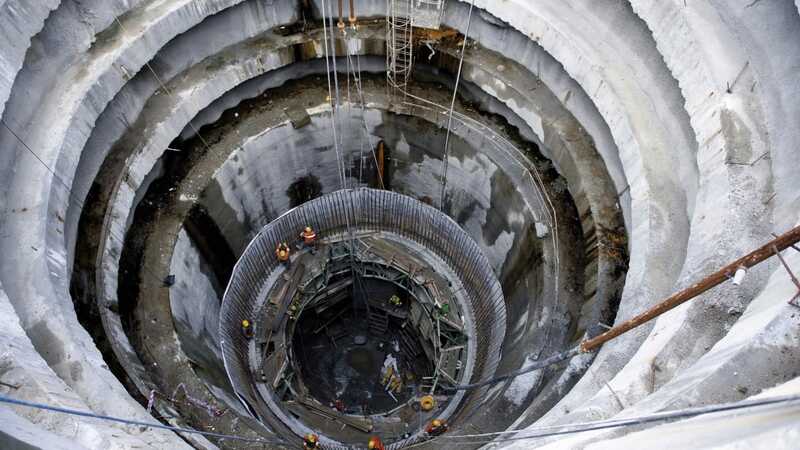 While the main focus of this article is to look at confined spaces from the perspective of constrained, restricted areas, rather than from the definition of confined space outlined in the HSE regulations, it is of vital importance to remember that working environments are constantly evolving. What may start as a simple constrained space could become confined as the working day progresses. Fumes and hazardous gases can accumulate in confined areas even if they are created outside of that space; for example, a worker welding near a confined space may have adequate personal protection, but could inadvertently create hazards for those in a confined space depending on variables such as ventilation at the worksite and the welder’s proximity to the confined area. In any working situation, whether confined space restrictions play a part or not, the key to successful health and safety is to instil a good working ethos. This starts with making sure safety and occupational health are core values in the workplace. It is to everyone’s benefit that work happens safely, ensuring the wellbeing of staff, co-workers on site and the general public. Efficient working practices that are planned and executed efficiently will deliver projects safely. This will also avoid frustrating stoppages on site that can cause delays to programme duration. This of course will also ensure that successful cost management is achieved. Another benefit to ensuring health and safety remains the focus is reputation management – for both client and main contractor. Reputation management reduces the risk of adverse publicity surrounding accidents or incidents on site. Health and safety should not be simply a priority – it should be a core value of the business. Safety should override everything else. For this to be effective it needs to be implemented at board level and down throughout every layer of the business. Regardless of the size or level of complexity of a workplace, every single working environment should have a tailored and collaborative approach to health and safety, no matter what. For example, from day one of a project a company’s onsite team, comprised primarily of its project manager and construction manager, effectively become safety managers and are responsible for all site safety. This is because they are central to everything that goes on onsite. While many companies do it differently, by making the key personnel responsible from the outset safety is integrated at all times. One of the first jobs of the safety managers is to produce a Risk Assessment Method Statement (RAMS) for the site with input from the site team themselves. By encouraging two-way communication on-site from the outset, operatives get involved and frequently suggest different, often better, ways of doing things. As a result, safety documents are updated regularly, delivering constant improvement that also gets shared across the business. One tool that is useful to employ on every site is a training matrix, a key document that can be central to the success of a company’s health and safety, and requires relevant criteria to be identified. For example, manual handling training will be required; this could be done in-house or completed using external trainers. If sub-contractors are being used, they need to make sure their workforce is fully trained. Occasionally workers do not speak English; this is something that must be accounted for during the training process, with the company then requiring physical evidence that operatives are fully trained. So, with an overriding health and safety ethos now in place, what are the other considerations for sites of restricted access or constrained spaces? Constrained and restricted sites mean efficient working has to be at the forefront and by introducing design for manufacture and assembly (DfMA) from the start of the project, as much work as possible can be taken from into a controlled environment, unnecessary work at height is reduced and congestion on-site is eased. Ultimately, this creates a safer and more manageable project. In recent years, building information modelling (BIM) has been a major talking point in terms of both its potential and the challenges of integrating it into the design and build process. For companies involved in the construction of UK publicly funded work, the next phase of this is the need to be digitally compliant. From a health and safety perspective it enables early identification of potential issues, giving our supply chain time to address them and as a business we are able to supply a clear view of delivery requirements for more accurate planning and improved on-site safety. This inevitably leads to fewer deliveries to site. It also facilitates easier risk assessment and identification of associated costs, resulting in fewer and only essential operatives on site, also minimising vertical and horizontal transportation – all culminating in a faster, more efficient programme. As a health and safety professional make sure your business is BIM-compliant by developing its approach to collaboration, structured data and sharing of information. One sure fire way to improve efficiency is to implement a detailed delivery and logistics plan. With space at a premium, a just-in-time delivery approach works effectively but must be organised and well managed. It requires punctuality, constant communication and adherence to set procedures. This approach can be supported with the use of offsite holding areas or consolidation centres, which allow control of what is delivered to site and when. On a constrained or restricted site where space is tight, making sure deliveries spend the least amount of time on site before installation avoids having to keep on moving materials around. Stockpiling materials can happen as a result of insufficient vertical transportation; this is inefficient and can increase the risk of accidents and damage. By calculating detailed piece counts and material movements and reviewing hook and hoist time allowed for each element of work, a detailed delivery and logistics plan can be developed and aligned to the programme. When pulling this together it is essential to factor in the following. Where work has to be carried out in hard-to-reach or busy locations, access and egress points will be limited and need to be kept separate from the general public and site pedestrian access. Detailed, advance and collaborative planning, taking into account the size and types of vehicles that can physically access the site, means the quantity of material that can be delivered to site can be calculated. This ensures the programme reflects any constraints accurately. It is also vital to consider the vertical transportation of both operatives and materials, particularly on high-rise projects. Constrained sites often limit options, so getting the location of hoist and tower cranes right and understanding how they will interact with permanent works can avoid costly problems later down the line. For example, when planning for the use of hoists, by considering vehicle delivery routes and pedestrian segregation you may avoid potential clashes, which could compromise safety. This is where the development of a 4D model helps to plan the build, proving invaluable in helping the client and supply chain contractors to visualise the project, especially from a health and safety perspective. Finally, let’s look ahead to delivering improved health and safety on constrained and restricted sites in the future. Of course collaboration in construction is nothing new, but the enhanced capabilities and knowledge digital engineering, a BIM approach and offsite manufacturing can bring to the construction table, are all certainly contributing to better health and safety on construction sites today. Continually, helping to identify new ways of working, which can be especially useful when working on the constrained or restricted sites of our global community. 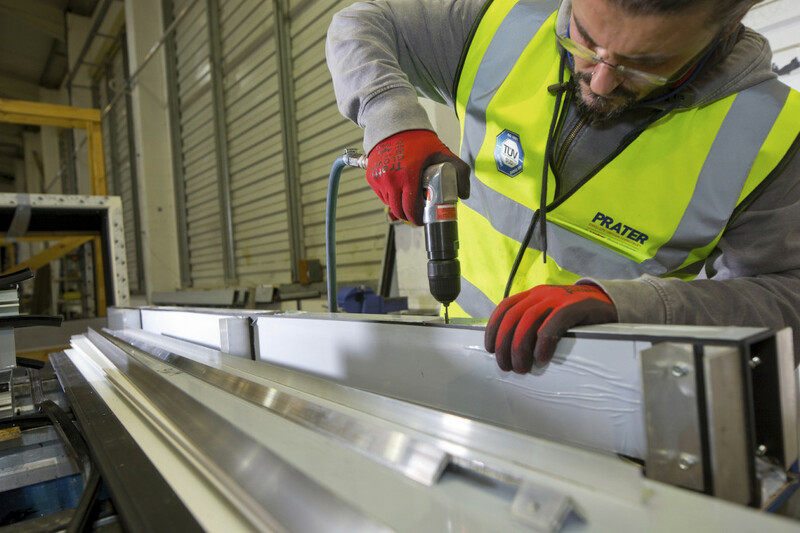 We have seen a dramatic increase in the number of clients opting to utilise offsite manufacturing capabilities and factories, and the type of work being undertaken is setting new benchmarks for the construction industry. 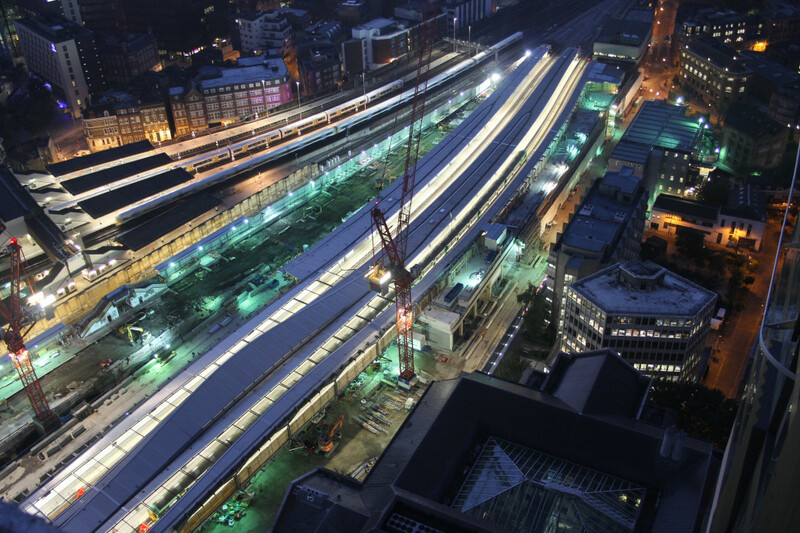 A fantastic example of this is the London Bridge Redevelopment – a constrained central London location with the busy and hazardous conditions associated with a live railway environment. To meet many critical milestone dates, construction activity had to take place in small complex areas and had to be completed to tight deadlines. The restrictive onsite access, the complex geometry and structure of the canopies and challenging timescales, meant that an in-situ solution was not feasible. As a result, complete structural roof cassettes with all the M&E services such as lighting and security cameras already integrated were craned in. This methodology was proven by assembling a full-scale prototype at an offsite facility in Thirsk with the help of structural steelwork specialists Severfield. This process was the first of its kind in the UK, and proved absolutely invaluable, providing the installation team with the time to train and ensure that when they got to site they could perform work safely, efficiently and effectively. In fact, 90% of the cassette manufacture and build was completed in a controlled environment and only 10% comprising the installation and fitting of infill panels on site. Most of the work was undertaken at ground level or close to the ground, proving to be a huge risk reducer across the project as a whole. Just-in-time delivery to this site also avoided common issues such as accidental damage, misplacement, even loss of materials, and the cost of the associated down time. With the boundary of Telehouse’s TN2 development within 5m of a main artery into London, the confined nature of the site presented the team with a number of issues when it came to the installation of 15,000m2 of composite cladding, which also featured bespoke components including the cladding panels and rainscreen - designed to look like a circuit board - louvres, windows and doors. TN2 is a large data centre on the outskirts of Canary Wharf. 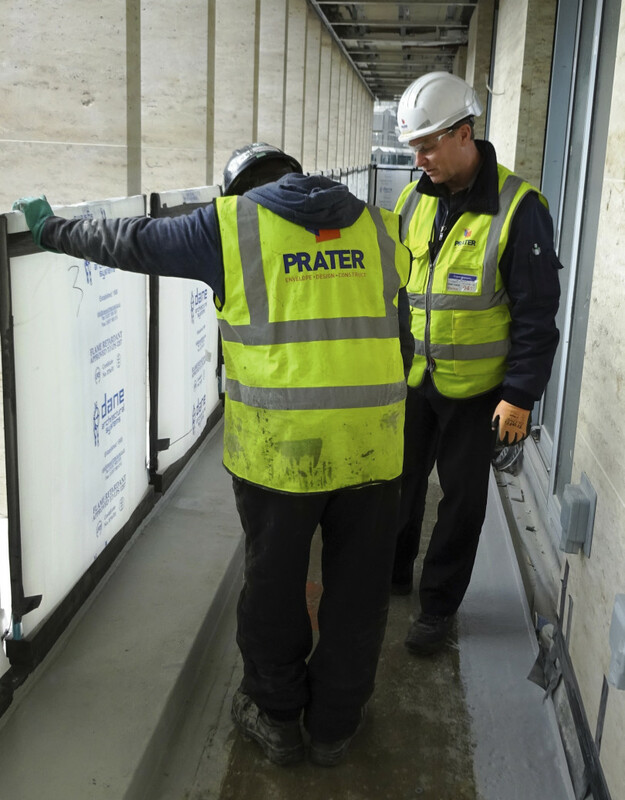 On paper it’s an 11-storey box, with Prater responsible for the full external envelope including walls and roof. In reality, the floors have a 6m-storey height, which actually makes it equivalent to an 18-storey building, requiring engineers to work at heights of up to 60m. The initial plan, due to the frame still being erected at the start of the cladding process, was to use mast climbers around the full façade and build these up as the frame was finished. However, due to the number of ties required to support the masts the building would be peppered with holes until the climbers were removed. This would mean a lot of infilling to make the building watertight late on in the contract. As a result of collaborative discussion and careful planning, the use of hanging cradles was adopted instead. This meant a smaller foot print at ground floor level, allowing better access for other trades, increased space for material distribution and, as the cradle arms were always above the working area, it meant the length of the Eurobond Rainspan panels could be doubled to just over 11m long. Taking this approach also removed the issue of mid span deflection with the smaller Eurobond panels. The plan all along was to use a spider crane from above to install the backing wall. And even when the weight of each panel increased to circa 300kg, this still proved to be within the crane’s reach capacities. Once the Eurobond was installed, a decorative rainscreen was added - the circuit board cladding design is made up of nearly 100 different types of panel that needed to be installed in a certain sequence from the middle, working up and outwards, all while being installed from a hanging cradle! As mentioned previously, all working environments are constantly evolving and what may start as a simple constrained space could become confined as the project and working day progress. As defined by the HSE regulations, a confined space entails any place including any chamber, tank, vat, silo, pit, trench, pipe, sewer, flue, well or other similar space in which, by virtue of its enclosed nature, there arises a reasonably foreseeable specified risk. Those in the construction industry work in these environments regularly, yet these spaces are not designed for continuous occupancy. They are difficult to enter and exit in emergency situations and potentially subject workers to numerous life threatening hazards. Confined spaces in the traditional sense also apply to instances where there is risk of death or serious injury from hazardous substances, where rescue scenarios need to be in place or dangerous conditions such as lack of oxygen means breathing apparatus is required. But if you thought confined spaces’ arsenal of pain just extended to asphyxiation, you’ll need to add explosions and electrocutions to your list of reasons to work safely. With this in mind it’s important to be aware of what a confined space entails and seek guidance from your site safety manager on how to keep yourself and your colleagues safe.